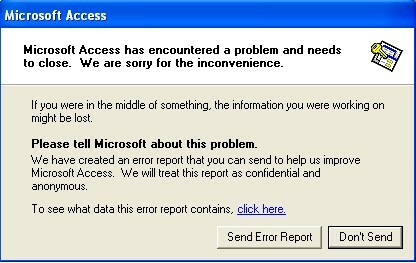 When we try to link our Access 97 database to QuickBooks using QODBC v10, our Access database crashes with the typical "send error report" screen as below. The VBDEMO program works without any problem. This Access 97 crashes problem was a known bug and this problem has been fixed in QODBC V271. Please update your QODBC to latest QODBC Version and test again.